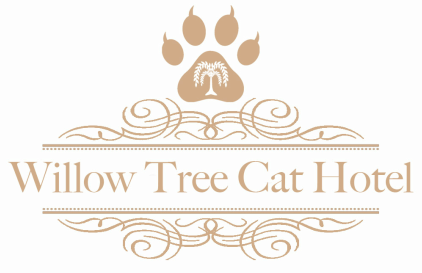 ​The tariff is applied on a daily basis, commencing on the guest's day of arrival at Willow Tree Cat Hotel. A full day’s board is charged for their day of departure in order to allow for the essential cleaning and preparation of the accommodation prior to our next guest arriving. ​By prior arrangement, a guest may be collected before the end of their booked stay with us, but the entirety of the booking will be charged as it will not be possible to re allocate their accommodation at short notice. 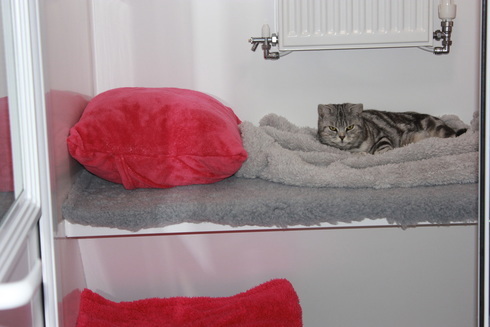 - Centrally heated sleeping areas with fully fitted 'Vet Bedding', 'Teddy Bear' cushions and blankets. The hotel's peak periods are May through to October and over the annual Bank Holidays listed towards the bottom of this page. ​We politely recommend viewings and bookings are made well in advance of these peak periods. During the hotel's peak periods the minimum booking is for 3 nights accommodation. Bookings of 23 days or more qualify for a 5% 'long stay' discount off our published tariff. Bookings of 50 or more days qualify for a 10% 'long term' discount off our published tariff. ​- Please refer to the 'Bookings' page for information on check in and departure hours over the holiday period. ​Barring extenuating circumstances, the published opening hours will be adhered to for all guest arrivals and departures. In the event of an owner returning to collect a guest before the end of their booking, the full stay will be charged if there is insufficient notice to relet the accommodation within the booking period. If a booking is altered with less than 15 days notice prior to the date of arrival, the original booking fee will apply. If a booking is cancelled with less than 15 days notice prior to the date of arrival, a cancellation fee of 25% will be charged. ​Payment is by cheque or cash on collection. By prior arrangement, BACS transfer is accepted. Guests must be fully vaccinated against Cat Flu and Feline Infectious Enteritis at least 14 days prior to their stay and can not be admitted without an up to date vaccination certificate. Where it is not possible to produce a vaccination certificate, we are happy to contact the relevant veterinary surgeon for confirmation of our guests vaccination status. To prevent infestation within the hotel's environment, we request that our guests have been treated for fleas and worms prior to boarding. Over the counter products such as Effipro Flea Treatment and Drontal tablets for worms are recommended as they will offer protection for 6 weeks and minimise the chance of any adverse reactions post treatment. Male guests over the age of 7 months must be neutered. For safety reasons, please ensure that any collars are removed before arriving at the Hotel. If a guest requires veterinary treatment during their stay, we will contact their nominated vet where provided. In the absence of a nominated vet, we will contact the hotel's appointed veterinary surgeon at Green Hollow Veterinary Practice, Ruyton XI Towns. We respectfully ask that all balances of accounts are settled at the time of collection, or in the event of long term boarding one month in advance of every 28 days. Any tariff adjustments are published by the beginning of November each year and are calculated in line with annual inflationary increases. Following publication, the adjusted tariffs are applicable to all bookings taken on or after the 1st January the following calendar year.